Now that you have an idea as to Cardiff’s IMHA history and clinical signs from my last article (see Using Integrative Veterinary Medicine to Treat Illness Affecting My Dog- Part 1), let’s discuss the integrative (combination of Western and traditional Chinese veterinary medicine) treatment I use to manage his illness. Cardiff’s therapy includes blood transfusion, immune system modifying medications and supplements, Chinese herbs, acupuncture, and a diet tailored for his specific condition. Based on my experience in treating his third IMHA episode (and similar positive responses I see with other patients), this multimodal approach prevented his disease from abruptly worsening and permitted improvement more rapidly than his previous two IMHA episodes. The medications (Prednisone and Azothioprine) used to suppress Cardiff’s immune system from destroying its red blood cells (RBCs) don’t allow his body to effectively fight off bacterial, viral, and fungal organisms. I have tapered his drugs to a lower frequency in attempt to avoid potential adverse side effects while maintaining control over his immune system. The balance between appropriate and excessive immunosuppression is tricky, so supporting his immune health via supplements, Chinese herbs, and whole food/non-processed diet is vitally important. For supplements, Cardiff currently gets Omega 3 Fatty Acids (Nutramax Welactin salmon oil), a chondroprotectant (Nutramax Dasuquin joint supplement), and a combination antioxidant and immune system supporter (i Love Dogs Reishi with Green Tea). Omega 3 fatty acids have a powerful anti-inflammatory effect on the blood, nervous system, and joints. The chondroprotectant optimizes joint health to reduce the reliance on pain medication to which he has previously had an adverse response. Anti-oxidants combat production of free radicals formed by his hyperactive immune system’s destruction of red blood cells (RBCs) and day to day activity. The immune system supporting supplement ensures Cardiff’s immunosuppressed body will be better able to fight off opportunistic infections. While immunosuppressed, Cardiff developed multiple warts, caused by Canine Papilloma Virus, which his compromised immune system could not fight off without additional support from a supplement. 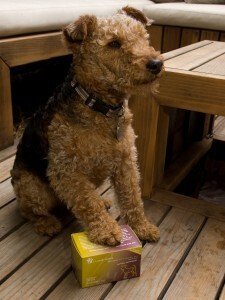 Fortunately, he got both immune system and antioxidant support by taking i Love Dogs Reishi with Green Tea tablets. Two weeks after starting this supplement, Cardiff’s warts began to regress. Several weeks later, the unsightly skin blemishes were completely gone! I am very grateful that Cardiff has the ability to overcome his IMHA and return to a state of health where he exhibits no outward appearance of illness. I wish he had not gone through three hemolytic episodes, yet he has repeatedly overcome adversity and has an amazing quality of life (see Cardiff’s blog). I hope that the integration of western and traditional Chinese veterinary medicine (TCVM) will keep his immune system at bay. Yet, should Cardiff have another IMHA episode, I know I can manage his condition so that he can get back to crazily squeaking his “Mr. Martian” toy (see Cardiff on ‘roids YouTube video). Everyone always says that Cardiff is a lucky dog to have me as a dad. Actually, I am lucky to have such an inspiring companion with a challenging condition, as Cardiff teaches me personal and professional life lessons every day.